Designed with safety in mind, the 2019 Mercedes-Benz Sprinter Vans come equipped with a broad range of advanced and innovative safety features. These features may include ACTIVE BRAKE ASSIST, designed to warn you of any oncoming obstacles, including pedestrians and other vehicles, and provide automatic braking. The Blind Spot Assist Mirror utilizes radar sensors to spot and warn of vehicles approaching your blind spots. This feature also works in concert with the Rear Cross Traffic Alert feature to alert for any pedestrians crossing behind the van. Traffic Sign Assist is another helpful safety feature that lets you keep track of the posted speed limit, allowing you to identify the right speed and avoid traffic violations even if speed limits change unexpectedly. ACTIVE LANE KEEPING ASSIST also prevents unintentional lane changes through its visual and audible warnings. This safety feature also applies brake pressure to help you return to your intended lane of travel. Other active safety features include ATTENTION ASSIST®, which helps prevent fatigue by keeping track of your driving patterns and providing early warnings against drowsy driving. ACTIVE DISTANCE ASSIST DISTRONIC® automatically maintains a safe following distance from other vehicles to prevent tailgating and rear-end collisions. In the event of an actual accident, the vehicle’s emergency call feature can detect the crash and immediately contact first responders. Safety resides in every single detail of this vehicle, including the details one wouldn’t ordinarily notice. For instance, the optional LED headlamps not only deliver a more contemporary appearance but also provide enhanced visibility under nighttime driving conditions when compared to traditional halogen lamps. The innovative windshield wiper system continually provides a clean line of sight, ensuring that forward view isn’t obstructed by bug splatter and other common debris. Are you looking to build your business and need a wonderous commercial vehicle? 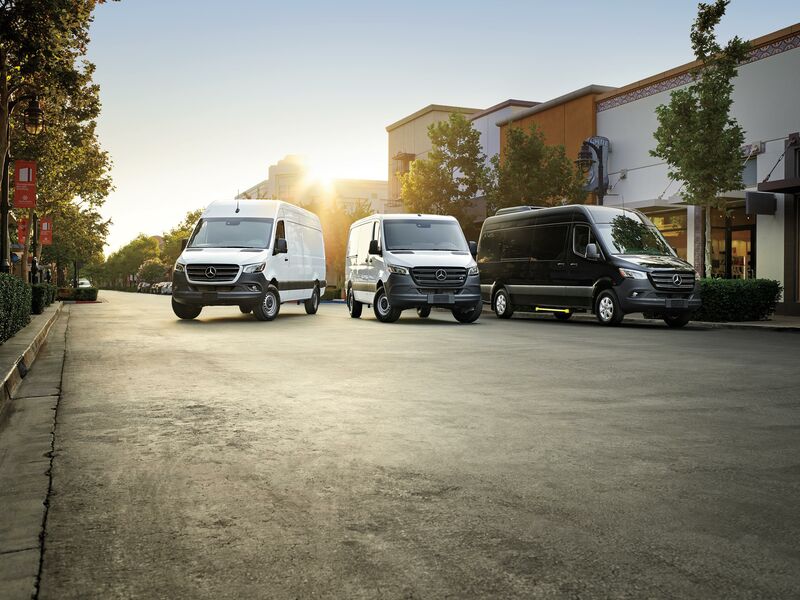 See all of the new Mercedes-Benz Sprinter Vans today at Walter’s Mercedes-Benz of Riverside. And don’t forget to check out all of the Mercedes-Benz finance options available. 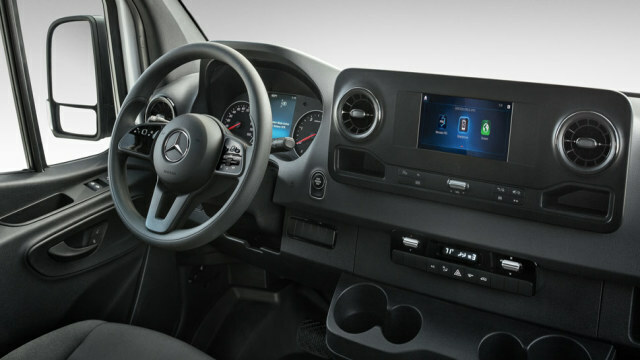 The 2019 Mercedes-Benz Sprinter Van is more than just an ordinary work vehicle with the mobile workspace in the cabin that’s designed to make your time behind the wheel easier. Each vehicle cockpit is placed in a logical location for enhanced ease of reach and minimal distractions from the road ahead. Those distractions are further minimized with the help of the vehicle’s smartphone integration feature, allowing for hands-free calling and other features that let you stay connected. The MERCEDES-BENZ USER EXPERIENCE touchscreen combines a widescreen for enhanced visibility and usability with intelligent voice control for hands-free usage. The optional navigation feature, combined with live traffic information updated in real time, makes locating work sites, client meetup points and other destinations easier. Wireless charging feature is also available for compatible smartphones, making it easier to keep the devices you depend on most charged up throughout the workday. Other charging options include USB-C and 12-volt charging ports located throughout the dashboard. 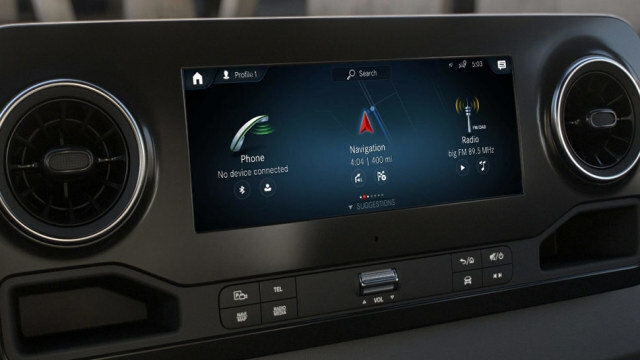 The 2019 Mercedes-Benz Sprinter Van also features Mercedes PRO connect, a comprehensive solution that provides valuable vehicle information to better manage your vehicle fleet, increase overall efficiency and optimize other aspects of the van, including maintenance, safety, and navigation. 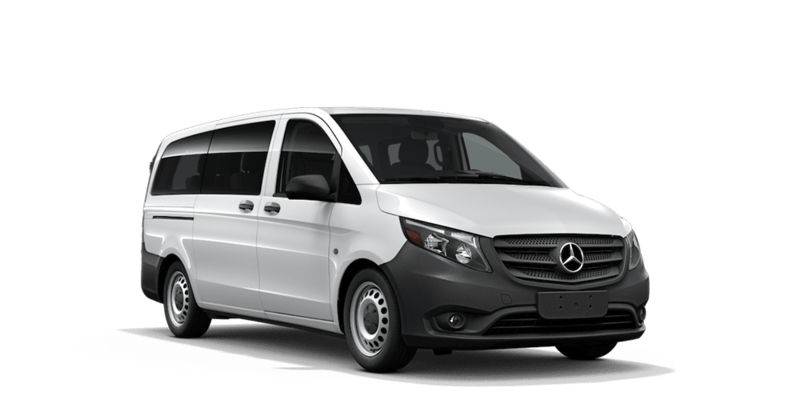 The 2019 Mercedes-Benz Sprinter Passenger Van is the ideal vehicle for anyone who needs to ferry passengers between destinations in style and comfort. Available black leatherette seating provides a luxury look and feel while maintaining its durability and cost-effectiveness. When your work demands call for hauling heavy loads, you’ll need a van that can easily meet and even exceed your needs. 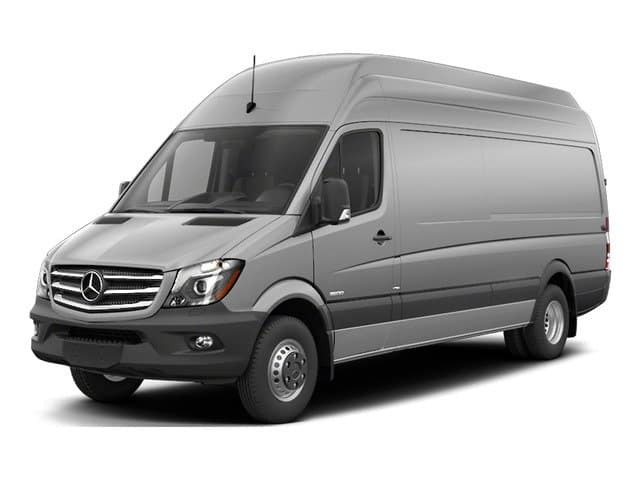 From the light-duty 1500 series to the high-capacity 3500XD and 4500 series, the 2019 Mercedes-Benz Sprinter Cargo Van is the vehicle to choose for all of your hauling needs. The current lineup comes available in a couple roof heights and trio of wheelbase lengths. While other variations come equipped with your choice of gasoline or diesel engine, the extended 170-inch wheelbase variant only comes with the 3.0-liter turbo diesel engine. The 4500 series offers an impressive payload capacity of up to 6,735 pounds. The 2019 Mercedes-Benz Sprinter Cargo Van also features a wide variety of convenience features to make loading and securing cargo even easier. There are plenty of cargo tie-down and pallet bracing points available, even for goods of unusual shapes and sizes. Variants not equipped with dual rear wheels also benefit from a square wheel arch that not only maximizes space but also provides additional storage opportunities thanks to its flat top. The rear doors of the 2019 Mercedes-Benz Sprinter Cargo Van also offer plenty of tricks to make loading and unloading easier. The back doors open up to 270 degrees to accommodate wide cargo and feature mechanisms to lock in place. LED strip illumination throughout the interior also makes it easier to load a shipment under low-light conditions. The 2019 Mercedes-Benz Sprinter Crew Van strikes the perfect compromise between the passenger and cargo hauling. This vehicle comes available in 2500, 3500, 3500XD and 4500 series with a 144-inch or 170-inch wheelbase. 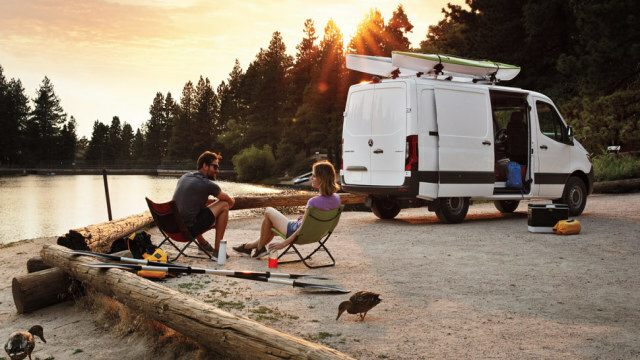 The van lets you bring your tools and crew along, thanks to its seating for 5 passengers and a generous 262 cubic feet of cargo space on short-wheelbase variations. The longer 170-inch wheelbase offers 370.8 cubic feet of cargo space. If you need additional space in a pinch, the three-seat rear bench can also be removed to accommodate additional cargo. The bench seat itself also uses durable upholstery to maintain its good looks no matter how tough the job gets. 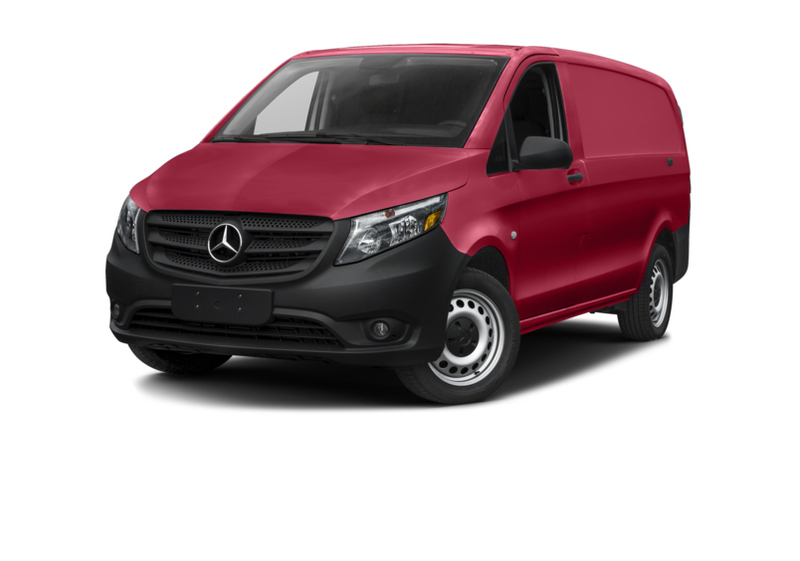 The 2019 Mercedes-Benz Sprinter Vans come in the varieties of the Passenger, Crew, Cargo and Cab Chassis. Each variant also features a dizzying array of unique configurations, making it possible to customize your vehicle to precisely match the roles needed for your business. Walter’s Mercedes-Benz of Riverside offers a plethora and variety of these commercial vehicles which you can see today. You will also discover that there are also finance options to sweeten any offer. The high roof body style maximizes passenger headroom while providing greater ease of entry and exit. The available Passenger Accessibility Package provides greater convenience for embarking and disembarking passengers by adding an electric sliding door and an electric sliding step on the right side of the vehicle. The van variant comes equipped with front and rear air conditioning, but you can also opt for a high-performance version of the rear air conditioner to help passengers beat the heat and remain comfortable throughout their journey. Available in 3500XD and 4500 series, the 2019 Mercedes-Benz Sprinter Cab Chassis offers a blank slate for a broad range of upfitting solutions. The series comes in 144-inch or 170-inch wheelbase lengths with a maximum payload of 7,430 pounds. Whether you need a stake bed for landscaping duty or a specialized ambulance body for EMS first responder use, the 2019 Mercedes-Benz Sprinter Cab Chassis offers a dependable and exceptionally versatile base for any unique need. 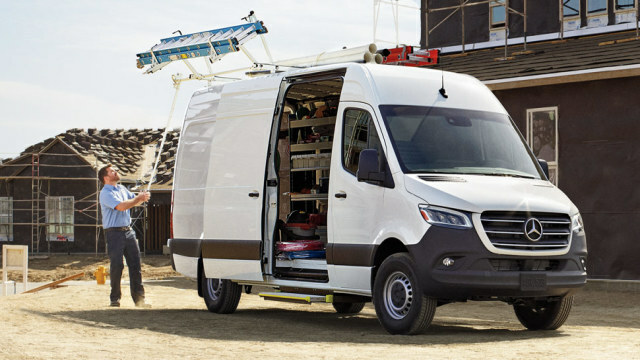 Designed to stand out in all the right ways, the 2019 Mercedes-Benz Sprinter Van offers a bold yet practical design that makes it easier to get any job done. Thanks to a steady evolution in design that adopts all of the successful traits of previous models, the vehicle offers a variety of unique and useful features to help keep down operating costs and maximize overall utility without sacrificing its attractive looks. The recently redesigned front fascia incorporates reshaped headlamps that are also located higher on the body to prevent damage caused by unexpected collisions. The wide black bumper and protective side trim are also designed to minimize collision damage, further reducing the need for expensive body repairs. These features also help maintain the value of your vehicle, making long-term ownership less costly and more advantageous. When you need to upgrade, you’ll get more for your money thanks to its impressive value retention. When it comes to maneuvering the van around tight areas, the 360-degree camera has you covered. This helpful feature projects a complete view onto the touchscreen display. With this feature, you’ll have complete confidence when parking or navigating through tight alleyways and crowded spaces.